Gin wins from the Gin Masters 2018! Oh hey there, what’s that? Over there? Glittering in the glorious sunlight? Why, it’s only a whole host of shiny awards from the Gin Masters 2018, bestowed upon our exciting expressions. Now, we’re not ones to blow our own trumpets, but when you win THREE Masters awards for Chocolate Orange Gin, Moonshot Gin and Swedish Rose Gin, then we think some trumpeting may be in order. Maybe those little trumpets that are generally less offensive if you live in a block of flats. Anyway, we digress. 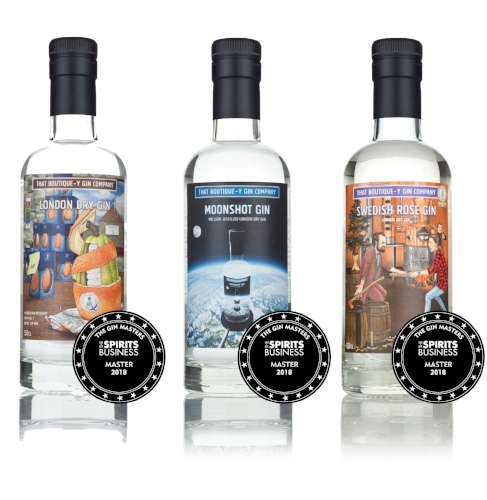 These awards recognise excellent gins, and we’re pretty happy that our Chocolate Orange Gin and Moonshot Gin topped the Super Premium category, while the Swedish Rose Gin – Hernö totally nailed it in the notoriously prestigious London Dry category. Woohoo! Then, there’s the golds. Another three of our gins picked up those marvellous medals. Yuzu Gin took one in the London Dry category and our deliciously fruity Spit­-Roasted Pineapple Gin and the Strawberry & Balsamico Gin each got one in the Flavoured Gin category. The judges all said super nice things too, like the Moonshot Gin was a ‘standout’ and the flavoured gins ‘had managed to capture fruit flavour with authenticity’. Surely that’s worthy of another little trumpet fanfare? Just a small one. Sorry neighbours. Off-trade/on-trade enquiries should be directed to our UK distributor, Maverick Drinks.